Motherhood doesn’t come with a handbook––but somehow moms just seem to know what to do! Yes, some days (and long nights) it seems like you may not have a clue, but we all pull it out somehow, LOL!! Each and every day, we run around like crazy after the little ones and the big ones. There’s carpooling (or solo shuttling) to music class, playdates, sports of all kinds. Don’t forget about meal-planning (and those trips to the grocery store), lunch-packing, advice-doling, and skinned knee-kissing. In between that…I blog…so, it’s no wonder mother knows best––we’ve seen and done it all, baby! 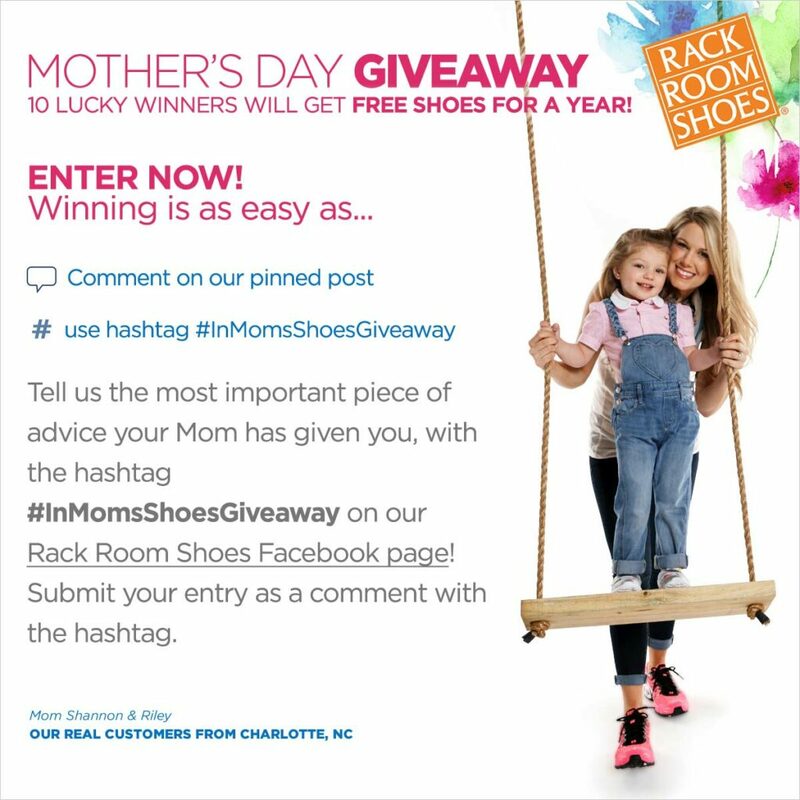 This Mother’s Day, Rack Room Shoes is celebrating all the wisdom our moms have taught us (or we’ve learned from our own experiences) through the years and rewarding it with free shoes for a year. Yes, that’s not a typo ladies…I wrote free shoes for a year. Ok, deep breath, settle, read on. Go right now to the Rack Room Shows Facebook page and let them know the most important “motherly wisdom” you’ve learned. Just comment on their pinned post using the hashtag #InMomsShoesGiveaway!!! Ten grand prize winners, selected at random one per day from May 1-May 10, could win a year’s worth of new shoes––because you’ve earned it. What motherly advice are you going to share? I would love to hear it since I’m still learning every day! One of the most important things I’ve learned since having my third baby Caleb…slow down, don’t get crazy, and just do your very best (though it’s very hard a many times) to just enjoy the ride. I know it’s cliche and you’ve heard it forever from older family members and friends…but time goes by so fast and it only seems to fly by faster with each passing year. My first baby, Natalie, is almost 10…I can barely even type that out. Liam is almost 8. Caleb turned 2 this past February. It seems like I was just on bed rest. Yes, times can be crazy and frustrating. There seems to always be so much to do and you are constantly pulled in so many directions, but try to let your kids be kids. So what there’s a little mess…the messes will not happen forever and there will be a time soon that you kind of miss them. Take a moment to stop and let your little one watch the train or dump truck passing by…he or she won’t be so enthralled by them for much longer. Let them have that extra cupcake, because they will have to watch their weight and go to the gym before you can blink your eyes. It’s a challenge, but that would be the best motherly advice I could give…everything else just seems to work itself out somehow. Lady and the Blog LLC has received compensation from Rack Room Shoes, but al opinions are my own.